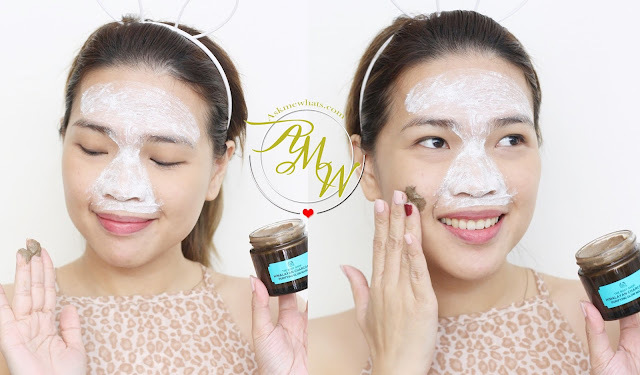 I have always been a "mask sheet" girl because I find it very easy-to-use and mess-free. With an active toddler around, who needs more mess right? But after attending an event for the launch of The Body Shop Exfoliators and Masks. I was able to do some research and read so many positive reviews about them, I've decided to forego my regular mask sheets and tried the 2 variants. There are a total of 5 variants to choose from aside from the 2 mentioned above, there's also Ethiopian Honey Deep Nourishing Mask, Amazonian Acai Energising Radiance Mask and British Rose Fresh Plumping Mask. When it comes to choosing masks, you have to know and understand the needs of your skin. And it doesn't mean you have to use JUST ONE variant for your whole face. For me who have combination skin, I like to mix and match. That is the advantage of using masks like this instead of mask sheets because you can mix and match. "Refine and revive your skin with our Himalayan Charcoal Purifying Glow Mask. Inspired by Ayurvedic traditions, this 100% vegan tingling clay mask is infused with bamboo charcoal, green tea leaves and organic tea tree oil. And it’s been formulated without parabens, paraffin, silicone or mineral oil. This invigorating charcoal face mask draws out impurities and refines the appearance of pores for healthy-looking skin with a glow that shows. Use together with our Facial Mask Brush for a truly pampering facial at home." "Give your skin a new lease of life with our Chinese Ginseng and Rice Clarifying Polishing Mask. Inspired by Chinese traditions, we have blended ginseng extract, rice extract and sesame seed oil into our 100% vegetarian creamy exfoliating mask, that has been formulated without parabens, paraffin, silicone or mineral oil. Use two to three times a week to reveal brighter-looking, even and supple feeling skin." On days I have a couple of breakouts or I need some tea tree action all over my face, I would apply the Chinese Ginseng & Rice mask all over my face, but on regular/ normal skin days, I prefer to apply it only at the T-zone where I need some "exfoliation". I also like to apply at the inner sides of my nose bridge where it tends to get "dark" and some pores may appear. What I like about this product is that it can help brighten and revitalize the skin around the area, making it extra smooth and glowing. 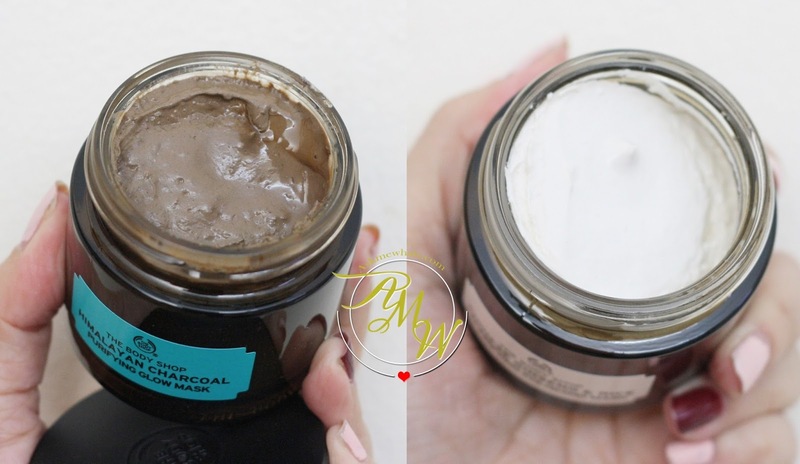 For the rest of my face, I like to use the Himalayan Charcoal Clay Mask. This has green tea leaves and tea tree oil (you guys all know how much of a Body Shop Tea Tree Oil Lover I am). I like to apply this on my cheeks and chin where I tend to breakout a lot! This product can help purify the skin and the tingling sensation is actually a nice touch knowing the product is doing its' action. All The Body Shop Exfoliating Masks are 100% vegan, not tested on animals making me feel great using this! They are formulated without parabens, paraffin, silicone or mineral oil so you know all the ingredients you put on your face or good for you! As for usage, I like to do this once a week or 2x a week if my skin needs the extra treatment. I like to do this after removing makeup and cleansing before going to sleep. It is best to apply a thin and even layer at first and always avoid the eye and lip area! Leave for 5 minutes for first time usage and increase to 10 minutes maybe if your skin is used to the masks! Be very gentle especially if the mask contain "exfoliators". I like to gently rub it without pressure as not to hurt the skin. I like to remove this using a soft cloth with lukewarm water and give a final splash with regular water after. Do not forget to hydrate your skin with your choice of face cream/moisturizer. Overall, I find both masks to be really relaxing, easy-to-use and surprisingly, not as messy as I thought! My skin felt a bit uneasy with the tingling sensation at first but after the first try, I kinda got used to it and liked the feeling. I call this a pampering session that I do once a week or once every 2 weeks on good skin days! I like how The Body Shop is creating targeted skincare products for specific skin concerns! I can't wait to try the other variant especially the Acai Energising Radiance Mask! Which particular variant do you think would work for you? Our shotie and I have multi-masking since last year and I think this will be a great addition to our bonding time.